Please try to freely arrange the paper sticky note by dragging. Drag and drop to the trash also nothing if not reminiscent. It is easy enough to would repeat the operation without a meaning. Sticky note genuine can not change the color later. 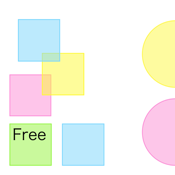 However, you can simply hold your paper sticky notes in a semicircle of pastel color, change the color with this app. It is effective management status of Todo, the categorization of brainstorming. Paper, you can not just text, enter the Drawing photos and sticky. Please enjoy Share Twitter, Facebook, Mail, Message in a text or picture which I drew. There are times when you have a great drawing on top of your favorite photos, it's throw away the sticky paper it is regrettable. Please drag and drop the sticky paper to the archive folder, which is located opposite to the trash in such a case. Sticky paper that has been placed in the archive are displayed in easy-to-read list, and edit it later, but you can. You can restore to the top screen at any time.